We go to Sam's Club every weekend to do the bulk of our grocery shopping, and I always look at the books. I don't often find anything exciting, but occasionally I come across something worth having. For example, a couple of weeks ago, I found The Miniature World of Peter Rabbit. These wee books contain original pictures and unabridged text, and I simply could not resist getting them for my littlest niece, who loves tiny things, like I do. I am sure she will enjoy hearing these lovely Beatrix Potter stories, assuming her parents can read the miniscule print. Ha. This week, I found The Twelve Days of Christmas in North Carolina. At first glance, I thought it would be silly, but as I went through it, I was pleasantly surprised. There is a lot of great information about our state in this book, and it's written in a lovely narrative style. It starts out with a little girl named Abby receiving a letter from her cousin, Mark, stating that her Christmas gift this year is a trip to NC to hang out with him and his mom. They proceed to fly all over the state, visiting some of the tourist highlights, and also working in things like the state bird (cousin Mark has a pet cardinal), state flower (dogwood), state insect (the honeybee), and the state carnivorous plant (the Venus flytrap). I had no idea there was such a thing as a state carnivorous plant. She even mentions some festivals, including the Statesville Balloon Festival, which we attended this past October. Abby describes her trip to her parents by writing them a letter each day, describing what she's done. I don't often come across contemporary books that qualify as living books, but I like this one. I learned things about NC I didn't know, just skimming through it. This book is one in a series called "Twelve Days of Christmas in America," and as far as I can tell, there are 20 books available so far. You might check and see if your state is available. 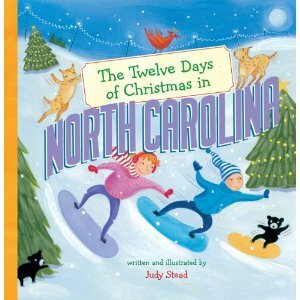 I like the North Carolina book, and will probably also get Michigan book, since Todd and I are Michigan natives. I may try to collect the series, because I think they are nifty! If you love Christmas books like I do, this one is worth checking out. You're not going to find anything about "the reason for the season," but you will learn about North Carolina and some reasons you might want to visit. If it makes you feel better, consider it a geography lesson. Edit: I just read this to Isaac, and on day 5, they talk about shipwrecks and pirates. They tell the legend of Blackbeard, and how his head was cut off and hung on the prow of a ship, and that his ghost is still there. I have no idea why this is mentioned in a Christmas book, and Isaac didn't bat an eye, but I thought I'd mention it.